NEW YORK -- In the wake of a privacy scandal involving a Trump-connected data-mining firm, Facebook CEO Mark Zuckerberg embarked on a rare media mini-blitz in an attempt to take some of the public and political pressure off the social network. 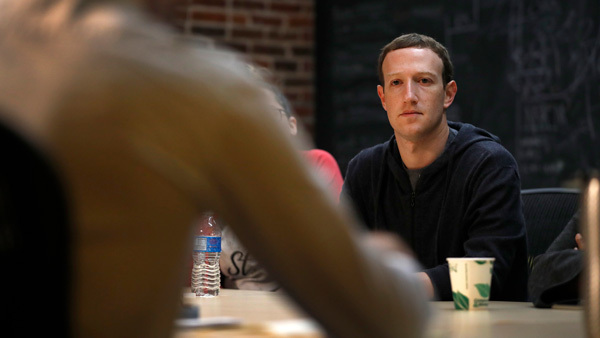 On Wednesday, the generally reclusive Zuckerberg sat for an interview on CNN and gave another to the publication Wired, addressing reports that Cambridge Analytica purloined the data of more than 50 million Facebook users in order to sway elections. The Trump campaign paid the firm $6 mlllion during the 2016 election, although it has since distanced itself from Cambridge. "I am really sorry that happened," Zuckerberg said on CNN. Facebook has a "responsibility" to protect its users' data, he added, noting that if it fails, "we don't deserve to have the opportunity to serve people." While several experts said Zuckerberg took an important step with the CNN interview, few were convinced that he put the Cambridge issue behind hm. Zuckerberg's apology, for instance, seemed rushed and pro forma to Helio Fred Garcia, a crisis-management professor at NYU and Columbia University. "He didn't acknowledge the harm or potential harm to the affected users," Garcia said. "I doubt most people realized he was apologizing." Instead, the Facebook chief pointed to steps the company has already taken, such as a 2014 move to restrict the access outside apps had to user data. (That move came too late to stop Cambridge.) And he laid out a series of technical changes that will further limit the data such apps can collect, pledged to notify users when outsiders misuse their information and said Facebook will "audit" apps that exhibit troubling behavior. That audit will be a giant undertaking, said David Carroll, a media researcher at the Parsons School of Design in New York - one that he said will likely turn up a vast number of apps that did "troubling, distressing things." But on other fronts, Zuckerberg carefully hedged otherwise striking remarks. In the CNN interview, for instance, he said he would be "happy" to testify before Congress - but only if it was "the right thing to do." Zuckerberg went on to note that many other Facebook officials might be more appropriate witnesses depending on what Congress wanted to know. At another point, the Facebook chief seemed to favor regulation for Facebook and other internet giants. At least, that is, the "right" kind of rules, such as ones requiring online political ads to disclose who paid for them. In almost the next breath, however, Zuckerberg steered clear of endorsing a bill that would write such rules into federal law, and instead talked up Facebook's own voluntary efforts on that front. "They'll fight tooth and nail to fight being regulated," said Timothy Carone, a Notre Dame business professor. "In six months we'll be having the same conversations, and it's just going to get worse going into the election." Even Facebook's plan to let users know about data leaks may put the onus on users to educate themselves. Zuckerberg said Facebook will "build a tool" that lets users see if their information had been impacted by the Cambridge leak, suggesting that the company won't be notifying people automatically. Facebook took this kind of do-it-yourself approach in the case of Russian election meddling, in contrast to Twitter, which notified users who had been exposed to Russian propaganda on its network. In what has become one of the worst backlashes Facebook has ever seen, politicians in the U.S. and Britain have called for Zuckerberg to explain its data practices in detail. State attorneys general in Massachusetts, New York and New Jersey have opened investigations into the Cambridge mess. And some have rallied to a movement that urges people to delete their Facebook accounts entirely. Paul Argenti, a business professor at Dartmouth, said that while Zuckerberg's comments hit the right notes, they still probably aren't enough. "The question is, can you really trust Facebook," he said. "I don't think that question has been answered."